ARLINGTON, Va. (Sept. 08, 2008) -- The Army kicked off a celebration recognizing 100 years of military aviation during a Sept. 6 ceremony at Fort Myer, Va. Despite heavy rains and flooded streets due to Tropical Storm Hanna, hundreds turned out to Conmy Hall to see the first public starting of the engine on a replica of the 1908 Wright Model A. The original of that aircraft flew Sept. 3, 1908 at Fort Myer. That flight was the first in a series that led to a $30,000 Army contract awarded to the Wright brothers in July 1909 for the first military airplane. A replica of the Wright Model A aircraft was on display Sept. 6 at Conmy Hall, Fort Myer, Va., as part of the centennial of military aviation celebration there. Elements of the 3rd U.S. Infantry (The Old Guard) and the U.S. Army Band, "Pershing's Own" participated in the event. In attendance at the ceremony Saturday were the families of Orville Wright and Wilbur Wright; Lt. Benjamin Foulois, who established the Army's first flight detachment; and 1st Lt. Thomas E. Selfridge, the first military aviation fatality. Ceremony hosts included Rep. James Moran of Virginia's 8th district, retired Maj. Gen. Carl H. McNair, and Vice Chief of Staff of the Army Gen. Peter W. Chiarelli. "Your ancestor's sacrifices to our nation can never be fully measured and will never be forgotten," Chiarelli told the gathered families of the Army's aviation pioneers. "We gather today to give credit to these men, 100 years past -- where the sound of Orville Wright's propeller first pierced the Fort Myer September air -- proving that he could fly the Wright flyer to specifications demanded by the Army." At the time, Chiarelli said, the "key performance parameters" Orville Wright needed to demonstrate in order to meet Army contract specifications included flying for at least an hour, flying with two men aboard his aircraft, and flying at a speed of 40 miles an hour. "Orville Wright succeeded, and a new high ground emerged," Chiarelli said. "It was one of the historic achievements of modern history. New ideas of warfare rapidly flourished." 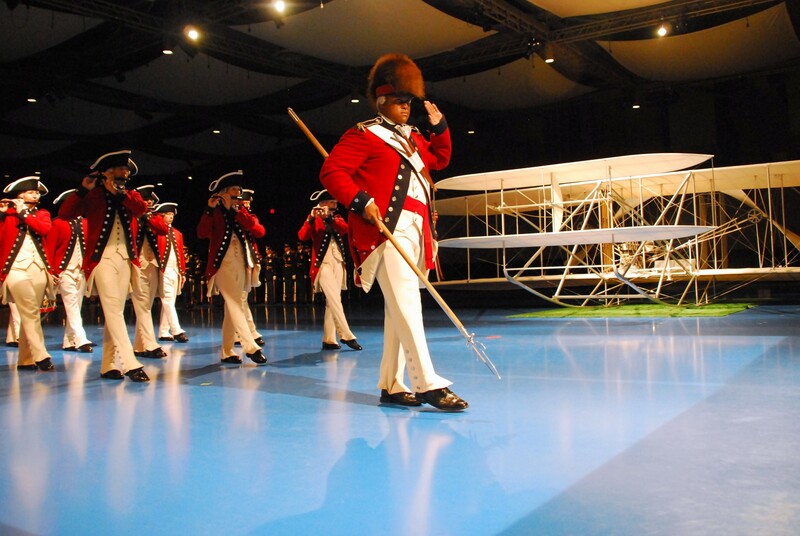 The Wright Model A replica was displayed in the center of Conmy Hall, under spotlights and surrounded by elements of the 3rd U.S. Infantry (The Old Guard) and the U.S. Army Band, "Pershing's Own." Following Chiarelli's speech, builders of the aircraft approached it and spun the propellers to start its engine. The plane's single engine spun its wooden propellers and filled the hall with a sound not heard on the installation for 100 years. It was the first time the replica's engine had been started as part of a public demonstration, an honor the builder's had saved for the Army's celebration of military aviation. Just a moment later, the builders powered the engine down, and the roar of the engine was replaced with the thunder of applause. Scott Rawlings -- a project leader for construction of the replica aircraft and a team member of "The Wright Experience," the group that built it -- said the team is attempting to relearn what the Wrights accomplished by doing just what they did. "The Wrights were pioneers, and they established aviation as we know it," he said. "We're trying to follow in their footsteps. We're trying to document what the Wright brothers did, and how they did it. We are going back, systematically, 100 years behind them and rebuilding all their aircraft. What we are trying to do is document it for further generations." Rawlings said there are no blueprints for the Wright Model A aircraft. Instead, there are photographs, journals, written documents and eye witness reports on how it was put together and the materials used. The Wright Experience, he said, uses modern technology and research to discern exactly how the Wright brothers built their aircraft. "It takes a lot of artisans, and we take photographs and overlay them with a computer- aided design program and then look a them from different angles," he said. "There are no blueprints, but we do a lot of research and find the original materials, all through their journals. Then we bring it all together. If we build it exactly as they did -- we expect it to behave as their aircraft did." Rawlings said the next stop for the Wright Model A is the National Air and Space Museum Steven F. Udvar-Hazy Center in northern Virginia. Col. Laura J. Richardson, the Fort Myer garrison commander, is also a UH-60 Black Hawk pilot. She said she didn't learn the role her installation played in military aviation until she was well on her way to taking command there. Part of the celebration at Fort Myer was to help others learn of that important part of the installation's history. "We are here promoting education and learning about our history," she said. "But also promoting math and science, for our younger kids. And I think it is also important to showcase what the military has to offer and important to have a good working relationship with your community." During the celebration of the 100-year anniversary of military aviation, Fort Myer opened its gates to the general public. It was the first time the installation had an Open House, Richardson said. In addition to the display of the 1908 Wright Model A, there were information kiosks set up where visitors could practice "flying" the aircraft on a simulator, and also see how it was designed. Retired Navy Lt. Cdr. Dave Gedra and son Steve Gedra, a 5th grader, were two that braved the rain to attend the event. Steve, a video-game expert, soccer player and Cub Scout from Fairfax, Va., tried his hand at the Wright Flyer simulator. He laid on his stomach and maneuvered an on-screen aircraft with a large wooden control stick. "It was hard," he conceded. Steve's father, who has only piloted a boat for the Navy, said it was his wife that noticed the centennial of military aviation event in their base newspaper. He said he knew he and his son had to check it out. "It's a great event," he said. "It's a shame the weather didn't cooperate -- but this is an important milestone to acknowledge and celebrate. Aviation, across the services, is critical to the capabilities we have."